Country Cottage on acreage near Sidney, Ferry terminal, Victoria Airport: Butchart Gardens 15 min away & Victoria 30 min. Within 5 minutes is the Victoria International Airport, Swartz Bay and Washington State Ferry Terminal. Within a 5 to 15 minute walk you can reach the ocean, store, tennis courts, a playground, Saturday market & hiking trails. 950 sq ft cottage was built in May 2016 & is surrounded by gardens and trees. It has a spacious full kitchen with a large island, dishwasher and all appliances. 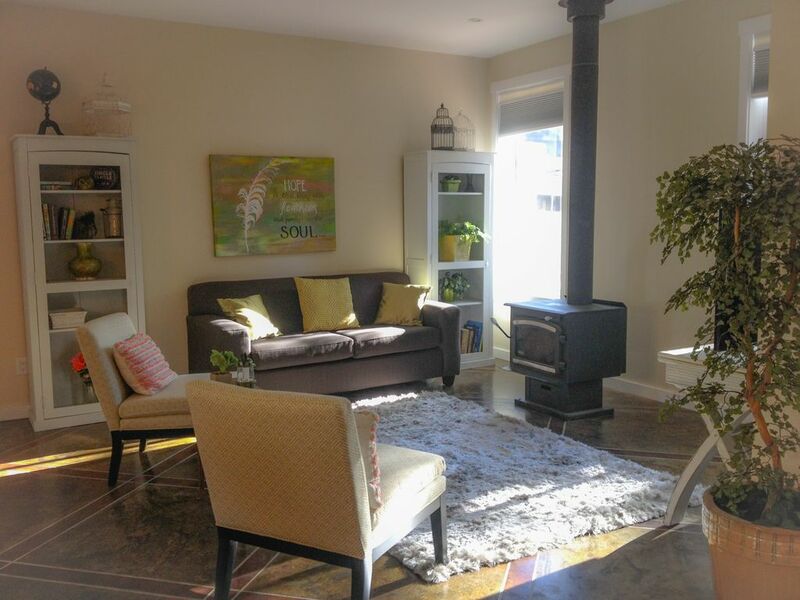 The kitchen opens up to a living room with wood stove. Two bathrooms both have bathtubs & the bedroom has an en-suite bathroom. We are an adventuring family that loves to explore the world. We have sailed from California to Australia, taken an RV across Canada and the USA among other adventures to Mexico, Hawaii and beyond. Above it all we love to call the Garden City of Victoria our home and have created a garden paradise of our own. This cottage is in a quiet rural area where walking paths, hikes and beaches are plentiful. On Saturday, walk down the street to the country farm market or the corner store for some ice cream or hike to nearby Horth Hill, one of the dozen public beaches or the Sidney Thursday Market. Bike paths can take you most of the way to Victoria and beyond. Be close to all the city has to offer while staying in a quiet rural farm community only minutes from Sidney by the Sea, BC Ferries, Washington Ferries, the Victoria Airport. 15 minutes away is Butchart Gardens and 30 minutes away is downtown Victoria. A variety of beaches are located within 2 to 5 kilometres of the cottage. wonderful cottage! Very clean and comfortable. The location was perfect and the cottage is very light and open. Kirsten and Normand were so nice and made sure we had what we needed. And meeting Warner, the dog, was an added bonus! Would love to come back and explore more. My husband and I stayed for 2 nights at the Country Garden Cottage. I loved the beautiful stained concrete floors. Great design, huge diagonal squares with banding separating them. Gorgeous design. The place was large and spacious. Big kitchen with huge Island. 2 very nice bathrooms for privacy. Laundry off the main entry. Table and chairs out back. Tv with DVD player and some kids movies. One bedroom with queen bed and a sofa sleeper in the living room. The family and their kids are very nice and welcoming. Only met the father the last night after already going to bed. Met the wife the day we left when checking out. There was some junk outside the front door on the deck when we arrived. Not tidy. The overall grounds of the property also looked unkept and somewhat junky as well. They were adding on a room on one end of the "cottage" that looked like perhaps a future rental or office space. It seemed like they expected us on another day because it did not look like they had finished getting the cottage ready for guests. It was out of sorts all over the place both inside and out. We found the bed very uncomfortable, lumpy, saggy and squeeky. We had to use both bed and sleeper sofa because it was too difficult to sleep the second night in just one bed due to it being too saggy. The kitchen was sparce. Not much provided. Some Dishes were chipped. Some were missing. Not many basics provided. Faucet was very wobbly, thought it would fall off. Hinges broken on cabinets. Bar stools felt flimsy. The outdoor table was odds and ends old junky stuff, not inviting, no privacy from neighbor. Area was overgrown with weeds. We love to sit outside, but did not feel comfortable to do so here. Very Unfortunate. Bathroom had no toilet paper. Had to search for it in the laundry room, tucked away out of sight, behind a mattress up on end. Laundry still in the dryer. Hand Soap dispenser in bathroom almost empty, only 1/4" left at the bottom. Not all towels were provided in both bathrooms, again had to search for a simple wash cloth. Living room spacious but uncomfortable. Sofa and seating very hard. No directions for tv. Only could get DVD to work. No way to turn up sound beyond a very low level. Very hard to hear movie. Only kids DVDs. Wifi did not work. We got better reception on our smartphones. The place has a lot of potential. But more care is needed to make it more inviting, usable and comfortable. Good beds are key for a good nights sleep. Thank you so much for your review. Our brand new sparkly clean cottage has been the happy recipient of many adventure-seeking guests. The gardens and the hanging baskets are there to greet you with seasonal flowers. We pride ourselves on our excellent location, private rural setting, spacious cottage, and comfortable bedding. We are so sorry that our mattresses or brand new smart TV, did not suit your needs. Pressing the "Netflix" button on the remote will give you plenty of things to watch. We appreciate you letting us know about the loose faucet, we have now tightened it. The high-speed fibre optic internet and Wifi always works but sometimes restarting the router is necessary. We do understand that sometimes guests may break or chip dishes or other items in the kitchen. It is well stocked with a full oven, stove, microwave, dishwasher, plates, dishes, glasses, baking ware and many other utensils. As we live only 200 feet away from the cottage, if guests ever have questions or needs supplies we ask that you let us know so we can respond right away should you wish to text us, call or take a minute to walk over. This allows us to provide you with the prompt, quality service we pride ourselves in. Our cell numbers and other important information are in the welcome book we leave in the cottage. We hope to continue serving happy guests in the future. Thank you for staying with us it was a pleasure hosting you! Great location, near farms, ferries and bike trail to victoria. Will stay here again!!! Will stay here again. Really liked staying outside of victoria, and biked in, hitting farms and other fun things along the way. The House was beautifully done. We had almost everything we needed, and if not the owner was right there helping with our requests. The location was nice as we didn't want to be close to anything loud and busy. Just a short drive to where we had planned to go, so it was perfect for us. The only thing I would suggest is a new mattress in the bedroom, it was pretty worn out. All in all had a great stay. I'm glad you enjoyed your stay. Sorry your mattress was not to your liking. It actually is a pretty new mattress. But we have taken your suggestions seriously and are replacing it. We want all our guests to have a fabulous rest in our cottage. Property was located in a great spot for our visit with family and friends . Nice quiet area close to Sidney , airport and Ferry Service . Unit had all the conveniences of home , except for no tv service and slower internet connection . Close to small market , coffee shop and gas station . Roost bakery also near airport for bake goods and breakfast . We are pleased you enjoyed staying in our quiet place in the country and found it conveniently located for your needs. Next month the weekly local Saturday farmers market will also be starting up at the corner of the main road a 3 minute walk away. In future visits please let us know if you would like a larger selection of movies to choose from or perhaps we could arrange for a Netflix login as we do want you to feel like you have all the conveniences of home. We recently had a fiber optic high speed data line added to the property for internet connectivity but it has not been performing up to the speeds we expected so we will be looking into this. Thank you for the feedback.